I find this neat Ate & Leather Backpack handmade in Bali. The maker of the bag has a pretty cool story to accompany the pictures. NOVICA, in association with National Geographic, offers thousands of limited edition and one-of-a-kind gifts, jewelry, and home decor treasures handmade by master artists and artisans throughout the world. 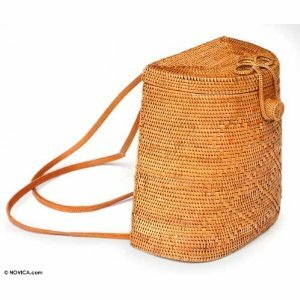 Balinese designer Nengah Danantara creates the ideal backpack for warm weather fashions. 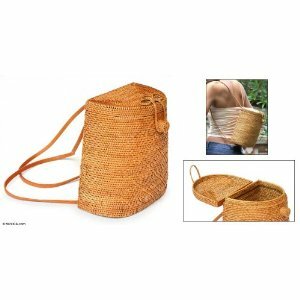 He weaves the bag by hand from ate grass, suggesting honeycomb patterns to adorn the bag's front. A hoop and button close the bag, which travels on leather straps. Artisan Info: "I was born on November 16, 1978, the second child in family. My mother is Nengah Suji, a senior ate maker in our village. My father was a cab driver; I often accompanied him driving around when I was a child. Time passed by, and I learned to print Balinese handwriting on a palm leaf, as well as carving images on this leaf; my grandfather taught me. When demand grew for ate products, many in my village started dedicating more time to this craft, and I saw it as a challenge to learn how to make these items too. "Weaving ate is not as hard as people may think, but it's not an easy work either. One needs a lot of patience to weave one tiny piece of ate into a basket or bag. "I would like to thank Novica for making my work part of the largest network of artists in the Internet. I hope my products find favor with Novica clients." You can buy the backpack HERE at my store. Images and information taken from Amazon.